In the end, the fight was made easily. For one reason. Boxing is a sport, but more than that, it is a business. The business of making money. 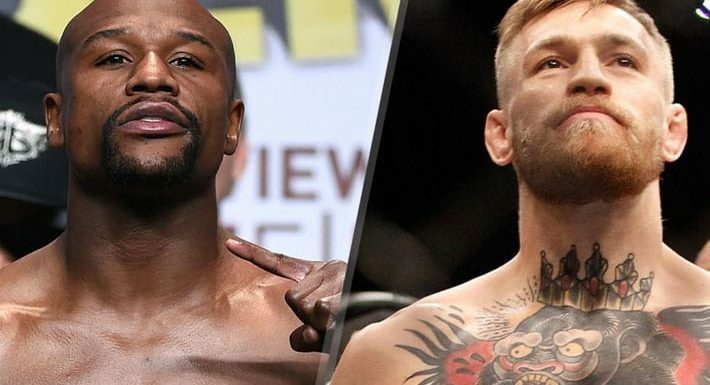 The agreement of the UFC, Al Haymon – who advises Floyd Mayweather – Conor McGregor, his handlers Paradigm Sports Management, and finally the securing of the two fighters’ signatures was simple: money. The biggest money-making fight on the planet. Any television network, and only Las Vegas, could maximize the potential of this collision of two sporting behemoths. And now just weeks away, the boxing match between Floyd Mayweather and Conor McGregor is on course to make unprecedented amounts of money. Sitting down for an interview just hours before his first contest with Nate Diaz at UFC 196, I suggested to the Irishman that a contest with Mayweather could be the biggest draw in fight sports. The reality of it was highly improbable, but something about it just felt right. Two huge stars, from two different fighting firmaments, creating a huge crossover explosion. Promotionally, it offered up so many intangibles, so much intrigue, and so, so much financial lucre. It’s not about the money, it’s about the money, as they say in Las Vegas. The Drop. What the event makes, but also what the city makes. McGregor, being McGregor, was nary phased by the prospect of discussing it, and hit the subject square like his left hand dropping the series of victims he’d exploited with those strikes from hell from which he can find exquisite angles, and which, along with his gift of the gab, have made him fight sport’s lightning rod commodity. There were several reasons for throwing it out there. I had witnessed first-hand the super-fight between Mayweather and the Filipino politician Manny Pacquiao, and having been around McGregor in his rise to stardom, the same magic stardust seemed to emanate from every event the irascible, gifted Irishman was involved in. Mayweather-Pacquiao had been an event like no other, grossing an estimated $700 million, breaking all records: setting a new pay-per-view record of 4.6 million buys, bringing in a gate of $70 million, and generating huge dollops of dough along the Strip. The fight McGregor was about to have with Diaz, sixteen months ago, which McGregor went on to lose, drew a gate of $8.1 million, and the pay-per-view reached 1.4 million buys. McGregor was the UFC’s bonafide cash cow, biggest star and most enigmatic figure. But Mayweather was retired, rich, and unbeaten in those 49 contests over 19 years as a professional across five weight divisions. He had earned close to $600 million. Would he really come back and face McGregor, the mixed martial artist and fighter who carried the Irish hordes with him, and a luck like no other, as if he’d swallowed the Blarney Stone, not just kissed the talismanic chunk of legendary rock? Would Mayweather open himself up to McGregor’s unique brand of psychological pre-fight warfare, and put himself at the risk – a very slight one – of tarnishing his longstanding legacy, and self-styled sobriquet of ‘TBE – The Best Ever’, based on his defensive genius and unblemished record? Would, and indeed could, a match be signed between two pugilistic bullies of the era? There was just a sense that McGregor had the kind of appeal which could magnetize Mayweather back to the ring. McGregor, it seemed, had a transformational quality, an appeal which crossed over, a confidence which knew no bounds. So in the course of a 30-minute interview, I threw it out there, suggesting that based on Mayweather-Pacquiao, could even be a billion-dollar fight. From there, the world witnessed a long back-and-forth series of social media counter-comments, the power of Instagram and Twitter igniting a fight which both men played a courting ritual towards signatures hitting the paper. McGregor wanted it – clearly because it would create a payday like no other – his estimated purses with the UFC having grown to $7-10 million, his worth per fight ranging from $25-40 million per event, while Mayweather put out there that he would need $100 million minimum to interest him, his earnings from the Pacquiao prizefight estimated at $240 million when the coffers rang in, ker-ching, ker-ching. In the end, a fight with little risk and huge financial reward was there for Mayweather. And for McGregor, the chance to earn more than ever, and have the opportunity to destroy history, and the form book. Win-win-win. The dance of words between the pair in public was mirrored by talks in the background. There were complexities. McGregor clearly needed the prerequisite agreements with the UFC, with whom he is contracted. Dana White made it clear that the fight organization would have to have a stake in the contest. There is a mainstream, crossover appeal to the event, but perhaps that stops at the fight itself. It has ever been thus with cross-code fights. The conventional wisdom is that this could be a major disappointment. But there is an X-factor about McGregor, and UFC president Dana White has done his utmost to spin McGregor’s chances, while giving himself an out – of course. White knows his boxing well enough. He also knows it is a money fight. When the betting line for the fight opened, Mayweather was a -1,000 favorite and McGregor a +650 underdog. Little wonder with Mayweather undefeated in boxing at 49-0, while McGregor had never boxed professionally. Despite such odds, White continues to promote a potential upset. “Conor is 100% positive he wins this fight, and I stopped doubting Conor McGregor a long time ago. When two men step into the ring or Octagon or whatever it is, anything is possible.” The crossover appeal just oozes out, courtesy of White, past master at promoting. It may explain why the contest is projected to break all pay-per-view records, the most being Mayweather-Pacquiao in May of 2014, which stands at 4.6 million, eclipsing the previous best of 2.25 million when Mayweather defeated Oscar De La Hoya in May of 2007. For McGregor, this is an opportunity to elevate him into a completely different firmament as a prizefighter. Perhaps dangerously so for the UFC, given the demands McGregor could potentially make of his employers after this contest, which could realistically net him $80-100 million, comfortably 500% greater than any MMA fighter in history. Randy Couture, who fought the boxer James Toney in an MMA match at UFC 116 in Boston, in 2010, believes the bigger picture helps young MMA stars of the future. “On another level (beyond money and the promotion), what Conor has done by going out and getting a boxing license has helped us all as mixed martial artists. He now has the protection of the Muhammad Ali Act that was started in 2000. That’s something we sorely need in mixed martial arts. Couture explained: “We need to come together as a group. We don’t need a union. We don’t need collective bargaining. That solidifies their status as the premier league or whatever they want to call themselves. We need a fighters’ association, create an open market and get the Ali Act amended and then let the promoters decide whether they want to be a sanctioning body or a promotion. If you want to be a promotion you can sign fighters to exclusive contracts. Let somebody outside that’s regulated by the Athletic Commissions create rankings and titles for us to then create an open market and negotiate for those titles and make those best fights happen. They’re not treating us as a sport. They’re manipulating the rankings and stripping titles. It’s not as it should be. Back in Las Vegas, at MGM Resorts and the T-Mobile Arena, Sin City’s money spinning machines are certainly gearing up for what could become the richest prizefight in history. But for Las Vegas itself, and for figures such as Richard Sturm, the president and chief operating officer of MGM Resorts Entertainment and Sports, it is ‘the drop’ which resonates across the entire city. Sturm knows that the high-rolling gamblers will flock to the fight capital not only to attend the fight, but to wager millions of dollars at casino tables during fight week. “Fights bring in a tremendous demographic for us and it’s been that way for as long as we’ve been doing fights in Las Vegas, with tremendous revenue-producing events, and without going into numbers… the phones have been ringing off the hook from people who want to come in — people who are customers and want to be here,” the reclusive MGM Resorts boss told the LA Times in June. Although Sturm expects a veritable queue of A-list celebrities with their private jets on McCarran Airport’s runways – the hold-up with a log jam of jets on the Sunday after Mayweather-Pacquiao was unheralded and caused huge delays – it is likely that the gate record will be broken at the 20,000-seat T-Mobile Arena. May-Pac brought in around $70 million, but only 500 of the MGM Grand Garden Arena seats were for ‘real fans’. My seat in Media Row F, that night, on the open market, was worth around $35,000. Add to this the multiple-city, multi-country tour with the two protagonists having taken in the UK, Ireland, the USA, both East and West coasts, in the middle of July to drum up plenty of theater and interest, and the freakshow promotion was sailing with the wind. What a win or a loss will mean for both fighters, and their respective sports, will be lasting for one, and soon forgotten for the other. A loss for the boxing great would be catastrophic for both Mayweather, and the sport. It would pin MMA to the mainstream map. Some of the legends of boxing, like the purist fans, do not believe it should be happening. Debate has parted the waves. Lennox Lewis, the former undisputed heavyweight champion sees it as a freakshow skewed so far over in favor of Mayweather, that it is purely and simply a mismatch. “It shouldn’t happen. It’s ridiculous. it’s all about money and if I were Floyd I would take it,” Lewis told me. “But if people are paying, Floyd’s going to take it.” And so he did. Eighties middleweight legend Sugar Ray Leonard believes Mayweather vs. McGregor is the biggest mismatch in boxing history, and not a fight not for the purists, but the mercurial ex-boxer and crossover star concedes that, fueled by social media and hype, it’s a contest the world’s sports fans want to see. That view is broken down by several other prominent figures in MMA. Chris Lytle – also a veteran of 15 pro boxing matches – has an interesting view, which I share: Mayweather is not an exciting fighter. Closer to home, or at least McGregor’s home, his 20-year-old SBG Ireland teammate, James Gallagher, explains exactly why this fight will sell. From a promoter’s view, the event is a good thing. Scott Coker, CEO of Bellator MMA, is a big fan. But he believes they should have signed a two-fight deal to compete in each other’s codes and prevent fringe fans from coming to a shortsighted conclusion about how the sports stack up. Nice idea. But Mayweather would never have agreed to it. And if McGregor does pull off the unthinkable? Having spoken to so many people inside the industry about this contest, and as a writer, broadcaster and analyst of both sports, for a very long time, my opinion is that we have to be excited. It is a moment in time; tectonic plates are shifting. It’s a fun mega-rich fight for the ages. There will be a lot of boxing purists poo-pooing this contest, saying that it shouldn’t be happening, that Mayweather shouldn’t be going for his 50th undefeated fight and beating Rocky Marciano’s record against a boxing novice. But when you’ve got the two biggest names in combat sports coming together in a contest of this type, people are going to accuse the organizers, promoters, the fighters themselves and the broadcasters of getting on the hype train. But you know what? This is a fight that the public wants. I see McGregor leagues and leagues and leagues below Mayweather in boxing ability and the fight as a massive mismatch, but chatting with everyone who stops me about the imponderables is still fun. There are factors that will be debated until the bell rings, and I do expect McGregor to hit thin air, over and over and over again. The difficulty for McGregor is pinning Mayweather down in this fight, and I fully expect the American boxer to surgically beat McGregor in a highly technical way. And yet, it’s hard not to be affected by the hoopla, razzmatazz and hullabaloo that will swarm around this contest, which will become the most written about fight event in history.